It might surprise you when I say that more often than not, I make my smoothies without milk. Sure, sometimes I make fruit based smoothies with milk and yogurt, but oftentimes I do not use milk at all in my smoothies, and sometimes no liquid either! This guide will help you find out which flavors work best in a smoothie so that you can make delicious smoothies without milk at home! Do you need milk to make a smoothie? The answer is no! You absolutely do not need milk to make a smoothie. In fact, some of the most delicious smoothies I have ever made do not have any milk in them at all. 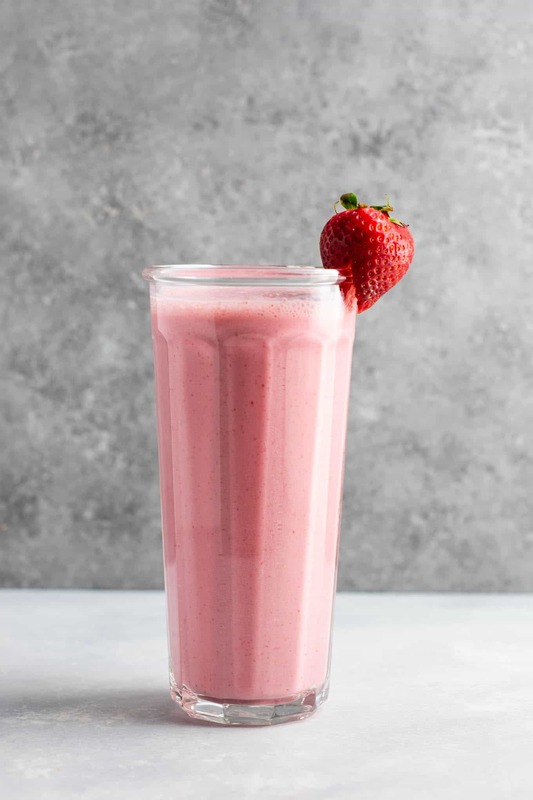 Sometimes milk is a great way to help build your smoothies, but it also can easily water down the flavor depending on the type of smoothie you are making. Green smoothies especially should never be made with milk in them. I discovered a long time ago that the very best green smoothie I have ever tasted is made with water, citrus fruits, and ice. Some green smoothies may taste good with milk, but I prefer the ones without it much better. You have to learn which flavors play well together and which ones clash. Otherwise you might find yourself hating smoothies and giving up on them all together. That was me for awhile and I had just about given up making smoothies taste good. Now that I know how to make delicious smoothies at home, I make them all of the time! Can you make a smoothie with water instead of milk? Yes! Water is a great way to add a little bit of liquid to your smoothies without the use of milk. 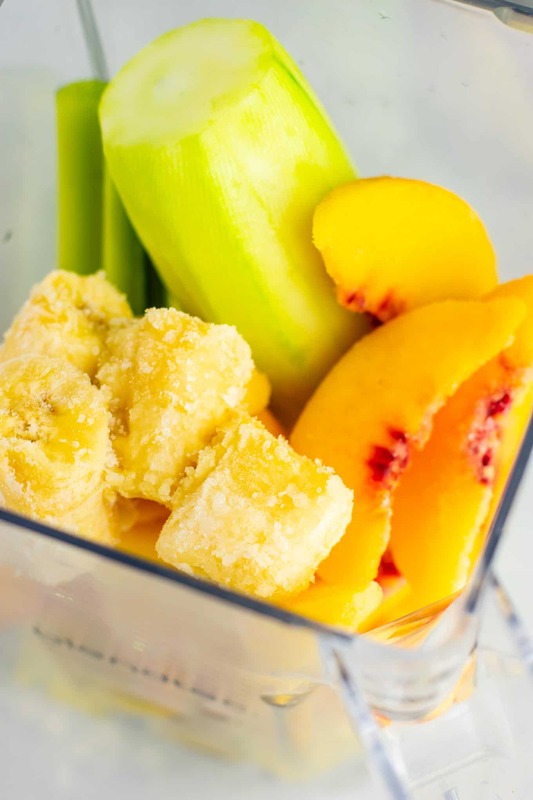 A great example of this is our Ginger Peach Detox Smoothie. 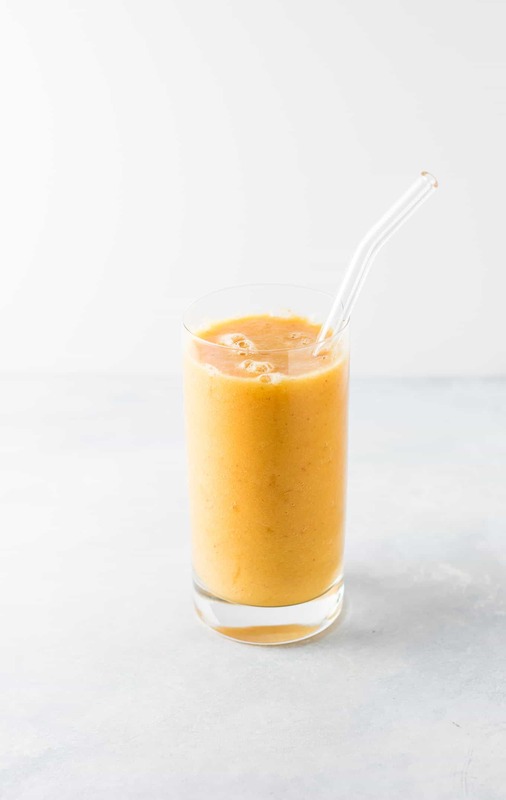 This smoothie uses just a cup of water in addition to high liquid fruits and vegetables including lemon, orange, apple, and cucumber. It’s important to note that you do not want to use a large amount of water in your smoothies or they can easily become too watery and lose flavor. The best way that I have found is to combine high liquid fruits and vegetables with just enough water to blend. This way you get a super thick and creamy smoothie without being watery. 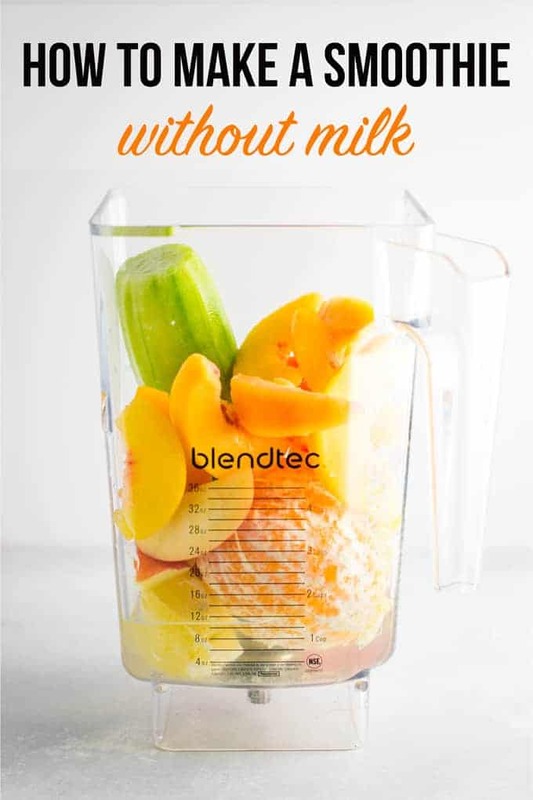 It is also important to note here that you will need to use a high speed blender such as a vitamix or blendtec for best results and creamy smoothies. How do you make a smoothie without milk or yogurt? As you have read above, the best way is to use high liquid fruits and vegetables along with water, as necessary. So what are the best high liquid fruits and veggies to use? Below are some of my favorite high water content fruits and vegetables to add to smoothies. My personal favorites to add are cucumber (you can’t taste it), apples (add a great sweetness), and citrus fruits. 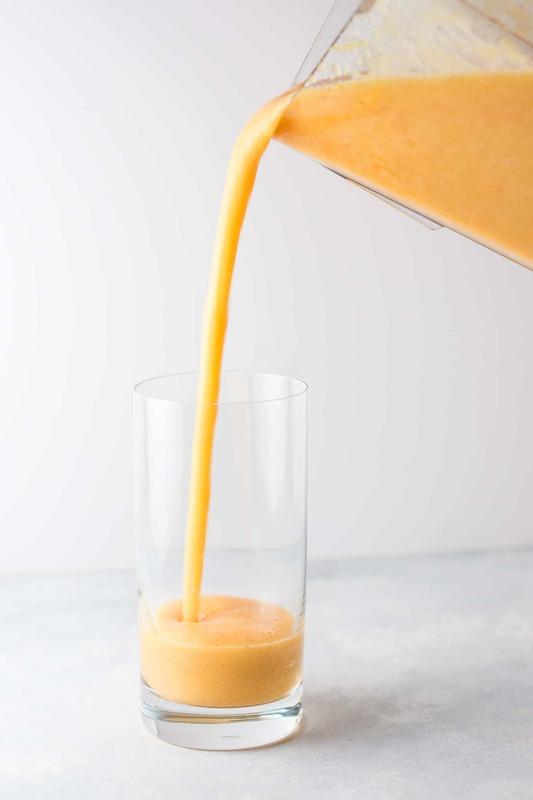 Pineapple, peaches, oranges, and lemons are all bursting with juiciness and great for replacing the liquid in smoothies. 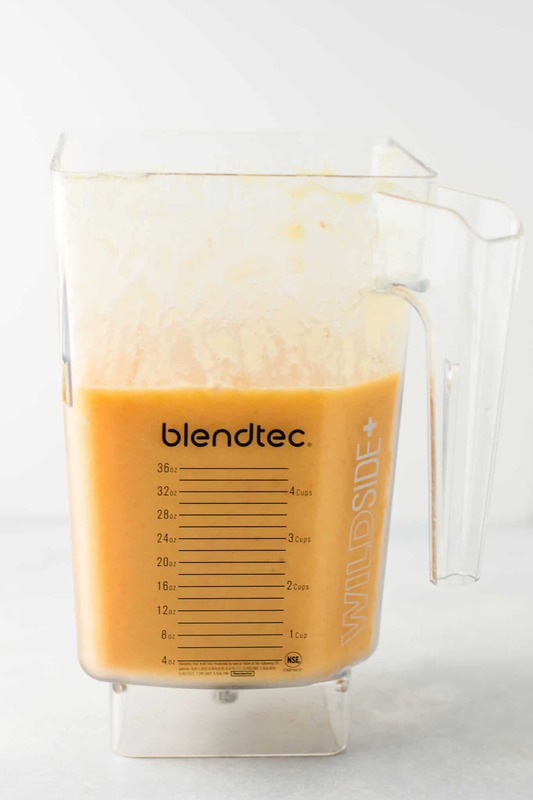 Depending on the strength of your blender, you can skip step 2 and just mix all of the ingredients at once. However, sometimes I find it helpful to blend the liquid parts first in order for the blender to handle the frozen fruit well. Can you make a smoothie without liquid? You might now be wondering if you can make a smoothie without liquid at all. Once again, the answer is YES! Just follow the same steps as above, but leaving out the water all together. I went through a phase for awhile where I ONLY made my smoothies without liquid. I just loved how thick and flavorful they were and I most often went with a super tropical theme! 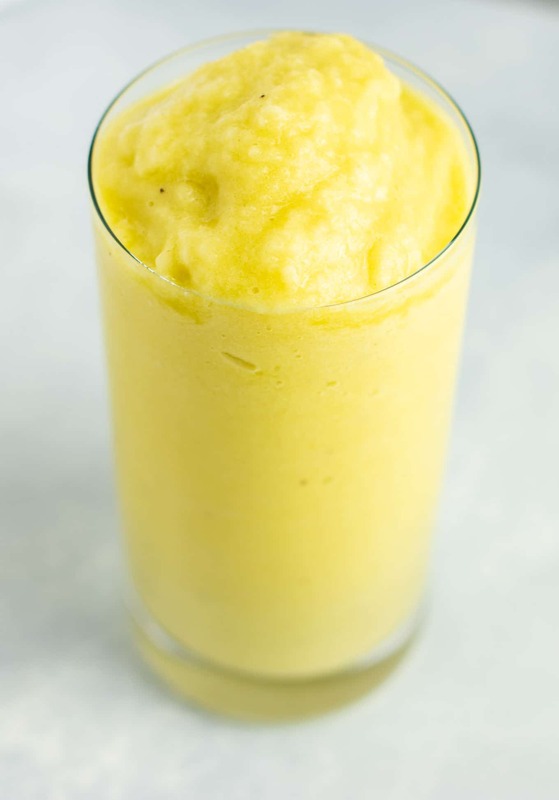 My pineapple detox smoothie has no liquid at all and tasted like a tropical frosty! Fresh pineapple, cucumber, and lemon were the “water” components, which I added to the blender first. After that, I added in my frozen fruit, ice, and remaining ingredients and blended until thick and creamy! One last thing to address in this post is how to make a smoothie thicker. Smoothies in my opinion are all about texture. I absolutely do not like runny, gritty smoothies. I prefer my smoothies to be super thick and creamy, almost to ice cream texture. This way it feels like a treat when I am drinking it! What I usually do is add my liquid and liquid fruits and vegetables, then blend to smooth. Add in frozen fruit and blend again. If my smoothie is not super thick (again, I like them VERY thick), I will add in a cup or two of ice, blend, and serve immediately. Once you go to ice cream thick smoothies you’ll never go back! If nothing else, I hope it inspires you to try more smoothies at home. I went years without knowing how to make a delicious smoothie and I only wish I had had these tips and tricks! Smoothies are really just a matter of science, and once you master the combination the possibilities are endless! Smoothies are a great way to get tons of nutrient packed goodness into your body, and they are a big part of my healthy lifestyle. Do you have a favorite smoothie recipe? Let me know in the comments below! Want to save this post for later? Click HERE to pin it! Did you make one of my recipes? I want to see! Don’t forget to tag me on instagram @buildyourbite and hashtag #buildyourbite with your recipe pictures! Looking for delicious smoothie recipes? Here are some of our favorites. Here you’ll find recipes of smoothies made with milk, smoothies made with water, and smoothies made with no liquid at all. I have personally tried and loved all of these recipes! Have you tried one of these recipes? Let me know which one is your favorite in the comments below! Joy your smoothie suggestions are the best I’ve found! I like the way you explained it simple and easy to understand. I’m new to smoothie making and wanted to find some that were made without any milk or dairy. I’ve found giving them dairy in the afternoon after school sometimes curbs their appetite for dinner. I think a smoothie will pair great with an after schoool snack. The big plus is it’s healthy with fruit and veggies in there as well. Thank you so much for your ideas I will be checking out some of your other post. I am so glad you found the post helpful! Smoothies sound like a great after school snack!